Product #20533 | SKU GPSL-16 | 4.0 (based on 1 rating) Thanks for your rating! Capture dynamic panoramic photos and video sequences with your action camera using the Scenelapse 360 Time-Lapse Device from GoPole . The Scenelapse features a rotating body used to set the pan amount and duration, with a full 360° rotation taking 60 minutes to complete. A 1/4"-20 screw is provided for attaching a camera or mount, with a three-prong adapter and hi-torque thumbscrew included for attaching a GoPro HERO camera. A 1/4"-20 thread at the bottom lets you mount the Scenelapse to a tripod, slider, or other support device. Specifically made for Gopro cameras, but I attach to my Olympus TG-4 camera. 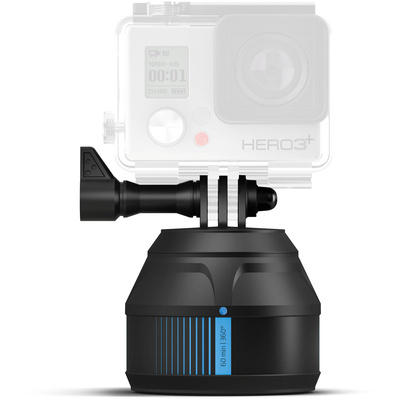 Gopro mounting system is removable with a 1/4 20" thread to attach compact/point+shoot cameras, and a 1/4 20" thread to attach a tripod. My Olympus TG-4 weighs 200 grams with lens hood, I can not confirm if the mount will work with Bridge Cameras like the Sony RX10.